Applications receive command line arguments just as any standard Java program would. You can use these to establish new default configuration settings. For example we are developing a UI for our Cinema application. The UI application (called “Cinekey” right now) when run makes a TCP/IP connection to a host running the Cinema application. By default localhost is used and the default port is 9610. You can even include these parameters in a Run key. If the optional host Ip_address is specified it will be recorded as the new default. If you specify the host you can also optionally specify the port. That will also be save as default. That means that if you do that once then you can just use the program name from that point forward to run it and it will use the last specified socket default. Here is the code for that. You can see how it can be adapted perhaps to your configuration needs. While JANOS strives to create a secure environment we generally fall short in that arena when it comes to applications. An application can listen for connections and process its own custom protocol. That is not so complicated to do but it is another big step to insure some level of security. We hardly ever get that done. If the custom protocol first requires a username and password, you can use the method that JANOS provides User.validate() to validate the login. The issue here is that the username and password are transferred in the clear unless the protocol requires a secure SSL/TLS connection. When an application implements the client side of a connection there is the User.digestMD5() method that can be used in combination with a NONCE to transfer credentials securely. Unfortunately we don’t have method available to validate digest encoded credentials on the server side. By the way, I think it is better to transfer the username and password in the clear than to not implement authentication at all. Note also that the vast majority of our applications run on a physically secure network. Still we can certainly ramp this up a level. Also, applications run with Administrator privileges and merely authenticate the supplied username and password. The supplied account then does not limit the application. So you can define a guest level account solely for authenticating access. If those credentials are then compromised perhaps by being transferred in the clear they are really not a security issue otherwise. In other words, you shouldn’t use an administrator account to log into these application protocols. In addition, an application protocol shouldn’t implement capabilities that compromise the security of the JNIOR by allowing configuration changes. We’ve been using a “nonce” string to encrypt credentials for transfer over clear text channels. The approach was first employed as an option in the JNIOR Protocol. It works like this. The “nonce string” is any string of random (usually printable) characters. It is generated by the server and supplied to the client either upon request or as part of an announcement on connection. The nonce can only be used once to authenticate a set of credentials. It should only be valid for a brief period of time, usually 1 or 2 minutes. The hash produced here is a 16 byte binary array. It is converted to a 32 character hexadecimal (case-insensitive) representation before it is used. The encoded credentials string is supplied to the server for authentication. The server takes the username from the string and looks up the password for the account. It then uses the nonce it supplied to calculate the digest as defined above. If the calculated digest matches that sent by the client the login is valid. Since it is practicably impossible to reverse the hash to determine the password for the account this limits risk when transmitted in the clear. It does not matter if the attacker knows the nonce. It is imperative that the nonce be single use and if possible only valid for the one socket connection. This is to prevent a replay attack where the encoded credentials are repeated by the attacker to gain access. An issue with the above is that applications do not have access to user account passwords in clear text in order to calculate the digest. JANOS needs to provide some assistance here. A validation method is needed. So it can be done. The following takes encoded credentials as if they were from a client to which we had supplied the random nonce. We then process the authentication without access to the password for the user. I am sure there are other ways to parse the credentials and to convert the hexadecimal string to a byte. JANOS does not implement the String.split() method. You can use Regex. As an alternative to processing the hexadecimal string you could convert hash2 into the hex string and compare. I am not sure which is faster. Here’s the split done using Regex. I had thought that I had implemented the String.split() method but no. I am probably thinking of the split() function in the PHP scripting. And here’s another way to convert the hexadecimal digest string into the byte array. JANOS implements a file permission scheme modeled after Unix file permissions. Those familiar with the Linux recognize the permissions in JANOS file listings. drwxrwxrwx   1 root      root          10 Nov 28 10:23 .
drwxrwxrwx   1 root      root          10 Nov 28 10:23 .. There are 3 groups of ‘rwx’ permissions. The first is for the file owner. The second for the group associated with the file. And, the third is for everyone else. This implies some kind of User Groups. Note that on the Series 3 there are no User Groups and so file permissions were somewhat shortened. JANOS allows you to define a User Group using the GROUPADD command. There is a root group by default to which noone belongs. The GROUPS command lists the defined user groups and any users associated with each. Back during JANOS development Kevin brought it to my attention how the TAB key was being used on the command line in other systems. Basically it served as an auto-complete function. The TAB has been implemented in JANOS with some twists. Once you work with a Series 4 at the command line you just can’t handle a Series 3 where you have to type every character. Where a file path or file name is expected the TAB will cycle through all of the valid names. For example In the following video I will type CAT and space and then hit TAB a few times slowly. When the desired file name appears I can hit ENTER. Let’s see jniorboot.log without typing jniorboot.log. In the above post Bruce showed us how to use the TAB as an autocomplete for the commands that are available from the command line. My favorite feature of the TAB autocomplete is filling out file names. In this quick video you will see that there are two files that names that begin with ‘jn’. You will see that i start typing the filename for ‘jniorsys.log’. I use the TAB key to cycle through the file names that start with “jn’. Another great place that the TAB work is when working with the registry from the command line. “Who does that?” you ask. I do. Yes the registry tab in the DCP is wonderful but for some, yours truly, the command line is faster. Especially when the TAB is utilized! In this video I want to change the hostname. Yes, there is a hostname command but I want to show how to use the registry from the command line. You will see that i use ‘reg’ which is the alias for registry. I type ‘i’ then TAB to look through registry keys that start with ‘i’. I select the ‘IpConfig’ folder. Now I use TAB to cycle through the available registry keys. Once i find hostname I type ‘ =” and TAB again to see the value. In general the TAB performs context specific auto-complete. By using TAB repeatedly each valid completion is displayed. If you find the a form of the entry that is appropriate you simply continue to build the command line and hit ENTER to execute. Generally TAB offers matching file and folder names from the current working folder or other folder if specified by preceding content on the command line. You may begin to type an entry and then use TAB. Only those completions which incorporate the starting characters are shown. So if you wish to filter the possibilities you can enter the first or first couple of characters. Similarly you can enter a path to a folder and completions will be content from that folder. A TAB used within the first word on a line will auto-complete valid commands and lines from those previously entered. Recently entered command lines are preserved in a history (See HISTORY command) which you can normally access using UP-ARROW and DN-ARROW. The TAB auto complete will include your history. So if you want to execute a MANIFEST command with the same options that you had previously run, you could hit ‘m’ followed by TAB and that complete command line will be one of the completions offered. Completions for the first word on a line will also include normal file entries which may be useful if you want to execute a program. If the REGISTRY or REG command is being built, TAB instead offers completion options from the set of matching Registry Keys instead of folder content. In this case too the TAB can be used immediately after the ‘=’ to complete the balance of the REGISTRY command with the current content of the specified key. With some experience you learn to use TAB efficiently and rarely need to enter an entire filename or Registry Key. For example once you have copied a UPD file to the /temp folder you can generally execute the JRUPDATE command very quickly with the following keystrokes. This assumes that the UPD file is the sole occupant of that temporary folder. Note that TAB presents you with optional auto-completion text alphabetically. JANOS remembers the last 16 unique commands entered during a single session. This allows you to user the UP_ARROW and DOWN_ARROW keys to scroll through the recent commands. A command can easily be re-executed by scrolling back to it and hitting ENTER. A prior command can be first edited. That may be useful when wanting to add an option to its execution. The HISTORY command displays the recorded commands. They are numbered but the HISTORY command does not give you the means to select from the list. Note that in addition to scrolling using the up and down keys you can use the TAB key to retrieve from the list. TAB when used at the beginning of the command line offers valid commands in addition to file names. It includes those from the recent HISTORY. If you want to recall the ‘help usermod’ command given the above HISTORY you can simply type ‘h’ followed by TAB until you get the line that you are seeking. Note that TAB presents options alphabetically. The WHOAMI command can be used to verify your login. While it seems trivial this command may be useful if you walk up to an existing login and need to confirm its permissions. A password may be changed using the PASSWD command. The PASSWD command is available to all active accounts but only an Administrator can use it to alter the password of another account by specifying the account user name. In addition, if you are not an Administrator changing the password on another account you will be asked to enter the current password before you can provide a new password. This is an added level of security. Sets the password for the user. Defaults to the current user. The USERDEL command removes 1 or more users from the system. This is not reversible. If you are uncertain about the deletion of a user you can add the Disabled tag to temporarily close the account using the USERMOD command. Multiple users can be removed by listing the users on the command line separated by spaces. The following would remove the ‘admin’, ‘user’ and ‘guest accounts. Note that there is no confirmation so use this command carefully. The command has no options and you must specify at least 1 user. Removes one or more users from the system. Multiple users can be specified separated by spaces. You cannot remove yourself by the way. This command is also only available to an Administrator account. The USERMOD command allows you to add or remove user account privileges or tags. The Series 4 uses three different tags: Administrator, Control, and Disabled. These are described under the USERS command topic. Basically accounts tagged as Administrator can do everything. An account tagged for Control can only manipulate I/O status. And, a Disabled account is just that, disabled. The USERMOD command actually violates the JANOS standard for command options. This command uses the plus sign ‘+’ as well as the dash ‘-‘ to designate an option. This is a legacy thing left over from the Series 3. Note that the USERMOD command can only modify a single user. So you cannot add a tag to a set of users. You must also specify a user. If you are at all concerned about security the USERS command is important! The JNIOR ships with four (4) default user accounts each with an obvious password. Two (2) of those accounts are Administrators. Most customers are not aware of this. We have seen where a customer will change the password for the ‘jnior’ account and think they are good to go. In reality the ‘admin’ account remains active and accessible with the default password. The USERS command is the only way you can see what accounts are active. The USERS command is part of JANOS and new to the Series 4. While the account situation, as far as having two (2) administrators, is the same with the Series 3 you can only see the active accounts on those older JNIORs by viewing the content of the /etc/passwd file. That file is not present on the Series 4. Here is a default account status as shipped. In addition to the two (2) active administrator accounts there are two other account. Not that those are Disabled by default. JANOS allows you to disable an account without deleting it. It was not possible to do that with the Series 3. In that case the ‘user’ and ‘guest’ accounts are active. An account tagged as Administrator has full access to the JNIOR. An administrator can access any file regardless of its permissions. An administrator can utilize every command available at the command line and can fully configure the JNIOR. An account with the Administrator tag has access to all of the capability afforded by the Control tag. An account tagged as Control can manipulate I/O. This includes toggling relays and adjusting external module I/O settings. These users cannot configure the JNIOR and are subject to all file permissions. You cannot log into a Disabled account. The account still exists and can be restored at any point. This tag can be used to temporarily make an account inaccessible. The account tags can be added or removed using the USERMOD command. Users can be added or removed using the USERADD command or USERDEL command respectively. The MODE command is rarely used and has one specific purpose. It controls whether or not the RS-232 (COM) port at the bottom of the JNIOR next to the LAN port is to be used for boot messages and command line interaction. Issue the MODE command without parameters and it will display the current status of the “diagnostics port”. By default it is enabled. You would disable this if you were to use that serial port as part of your application to communicate with another device. In that case any spontaneous messages or command line interception would cause your protocol communications to fail, so you disable it. To disable the diagnostics port issue the MODE -S command. You can think of the ‘S’ option as being “Silent”. To enable the diagnostics port issue the MODE -V command. Okay in this case the option perhaps means “Verbose”. This is the default. Now there is an Easter Egg here. JANOS has a few undocumented command options. There are very few and most of them provide some cryptic debug information more or less for my use. But here’s one for you. The MODE -A command is undocumented. This enables the AUX port for command line interaction. Once you issue the MODE -A command any character received on the AUX port will start a command line process there. You cannot disable this mode. It is reset on reboot. This “feature” was added to facilitate production program and test. The builder that initially programs the JNIOR and tests all of its I/O uses a command line connection through the AUX port to test the AUX port. Here we see that a command line process is now active on the AUX port. For this to work, you must not have an application running that uses the AUX port for communications. If you have used an application on that port you may need to prevent it from running on boot and to reboot the unit. The application may program timeouts and other port features that will interfere with the command line use. The port must also be set for 115,200 baud. In order to breath life into a being you must get its heart beating. For a generic operating system the heart is it’s multitasking capability. In developing JANOS one of the very first modules that was created was the one responsible for coordinating the execution of multiple independent processes. Practically every microprocessor program that has been written is responsible for, and therefore juggles, more than one task. Even those that seem to be so specific so as to be focused on one single task end up responsible for two or more sub-tasks. That doesn’t imply though that every program need implement sophisticated multitasking algorithms. In most cases a simple loop need be employed to cycle through the various tasks at hand. With a focused application a control loop is often sufficient. In this case task A, B, C, etc. are executed in sequence if they are needed. Once all tasks have been given the chance to run the loop is repeated. Depending on the needs of the application a loop may repeat as often as possible or it may have the luxury of sleeping. The latter being helpful in reducing power requirements. The rate at which a control loop repeats is variable and dependent on the number of tasks that needs to execute in each cycle and the amount of time each task takes to complete. If there is one task that is time sensitive there can be issues. If the total time required by the other tasks that need to run delays the loop too long, the time critical task may fail. The programmer has to take this into consideration. This can be a real problem if any task becomes dependent upon an external event and must wait for an indeterminate amount of time. When a task has to wait it is prudent to move on and let other activities be performed in the meantime. We can employ a state machine. Here we break the current task down into a set of sub-tasks where a variable is used to keep track of the current sub-task. If a task has to wait it exits allowing other tasks in the main control loop a chance to run. When the main loop returns to the task at hand, the state machine takes us back to the point where we left off. If we still have to wait we exit again otherwise we handle the next step in the current task. With fairly complex applications, the main control loop can become complex. The programmer may need to implement some kind of priority scheme. This would increase the time allotted for a set of tasks and force others to take a backseat. Then if multiple tasks require state machine implementations the overall dynamics start to become fuzzy. The programmer suddenly finds situations where the system may behave strangely leading to tweaks and eventually a feeling of careful balance. It works but you are now cautious not to add much more to it. Not without emphasizing testing. Consider a generic operating system such as JANOS. Here there is a spectrum of system tasks that may be optionally running. Then there can also be multiple programs developed by others (of varying skill levels) running in the system and requiring CPU time. The resulting set of tasks can be so unpredictable that a simple tasking loop is doomed to failure. A program may need to wait on a communications channel and the third-party programmer does not realize the need to return to allow other tasks to run. At a minimum this slows the system down and suddenly the task handling network traffic might start to cause timeouts and protocol failures. You just cannot predict this let alone control it with the simple loop approach. So rather than to even try, JANOS employed a preemptive approach right from the start. Now every task becomes a process. Each process executes within its own context. Every context is isolated from other contexts creating independent processes. A timeslice is defined. For JANOS a timeslice is 32 milliseconds. JANOS allows each process to run for up to one timeslice before forcibly moving on to another. A process can relinquish its timeslice when it is waiting on something but it cannot monopolize the CPU. In coding JANOS the main.c program was the first created. It performs some initial configuration and starts the Process Engine. From that moment on the system became capable of executing more than one process. The main.c procedure then dubbed itself the “Startup Process”. Once it completes its required steps it renames itself as the “Idle Process” and falls into the tight wait loop. From that point forward it becomes solely responsible for collecting unused CPU time. This being the equivalent of twiddling your thumbs. Before becoming the Idle Process mode the Startup Process initializes the Network Service. This process runs at all times and with priority to insure that all network traffic is handled properly and in a timely fashion. The Startup Process also starts the System process. The System process consists of a simple control loop executing low-priority background tasks such as logging, memory cleanup and event notification. These are the three low-level processes in the OS that run always and cannot be stopped. Here some of the complexity becomes apparent. In addition to the three base processes that I have described we see some others. The jaccess.jar program is running. This is an application that the HoneyPot uses to create the Mirai Botnet Map web page that it serves to the public. While the Web Server process is required for you to access those pages it is likely running here because I have the DCP open in my browser. In fact the Console process there is mine as well. This results from a session in the Console tab of the DCP and that is where I executed the PS command you see above. Finally there is a Command process running for some other random IP address. That indicates that there is a Telnet session open. On the HoneyPot those are generally from a Mirai infected host trying (unsuccessfully) to log into this JNIOR. Under JANOS there can be as many as 16 separate processes (including the Idle Process) running at one time. So what is in the Process Engine that creates this preemptive multitasking environment? It may or may not seem complex to you. I have managed to create a preemptive environment on a variety of processors including the Z80, HP’s early entry into the minicomputer market, CP/M running on early Intel processors and many others. Notably I added this to the Dallas DS80C400 which created the multitasking capability found in the Series 3 JNIOR. The TINI OS that forms the basis of the Series 3 OS is not originally capable of multitasking. JANOS runs preemptive multitasking quite successfully on the Renesas RX63N. To create a preemptive multitasking environment you need a few basic things. The first is a good 1 millisecond interrupt forming a process tick. You also need a way to switch program context with a minimum of overhead. And finally there needs to be a good atomic means to create a mutex (mutual exclusion object). That being a synchronization technique to control access to system resources when multiple processes are contending for them. The main.c program during the initialization of JANOS sets up one of the timer registers in the RX63N to divide down the system clock and generate an interrupt every millisecond. The Process Engine first uses this to tally milliseconds and thereby track uptime and to create a real-time software clock. Then on every 32nd tick the Process Engine moves forward to see if another process is pending execution. In that case the context is changed and the next process is allowed to run. The RX63N uses two stack areas. There is a User Stack which programs normally use to PUSH and POP data. The C Subroutine entry implementation also allocates local variables on that stack. For software to be re-entrant and therefore functional in such a multitasking environment it must store all of its variables on the stack. Now that can include pointers where each instance of that subroutine might allocate its own memory blocks and save the pointers. Later the route needs to release those blocks to avoid memory leaks. The point being that the “context” is really the stack content. In addition to the User Stack the RX63N also uses an Interrupt Stack. When an interrupt occurs, for instance when the internal timer register is ready to signal 1 millisecond, The program pointer and certain critical resisters are save on the Interrupt Stack before running the interrupt service routine. So for JANOS to change processes it simply saves the User and Interrupt stack pointers in the Process Table for the current process and then locates the next process that is ready to execute. The User and Interrupt stack pointers are updated from the Process Table for that process and we return from the tick interrupt. Ahh, but now we are not returned to where were just interrupted but to where the new task was interrupted before and so it continues. The originally interrupted process then waits for its turn to run again. To change processes and context we swap two stack pointers. This is an extremely efficient (time wise) and low-overhead task swap. We do have to push all of the other registers onto the stack before swapping to insure and complete context swap. It happens very quickly. JANOS jumps cleanly from one process to the next without any process realizing it had been set aside temporarily. This approach requires that we pre-assign 16 independent User Stacks and 16 independent Interrupt Stacks in the Process Table. Fortunately the RX63N has sufficient internal high speed RAM. The Process Engine initialization called by main.c gets that done before enabling the 1 millisecond tick. Now to create a new process a PROC_create() method is provided that defines the starting point for the new process and passes a couple of useful parameters. The Web Server for instance starts at an entry point named HTTP_process(). An new entry is added to the Process Table for the new process. The name of the new process is one of the parameters supplied. The User and Interrupt stacks for the new process are initialized with content and initial values as would be expected when a return from the 1 millisecond interrupt is executed. Once everything is in order a flag for the new process is set allowing it to execute. We return from the creation routine to do other things but when our timeslice is up, the new process also proceeds from the point we defined. If a program runs non-stop for its 32 millisecond timeslice it will be preempted. It then waits until it can continue after other tasks get their time in the sun. If a process needs to wait it can release its timeslice by calling PROC_yield(). This call generates a software interrupt that then performs the process swap and starts a new timeslice. The yielding process will continue once others have had a chance. Often we know about how long we will need to wait. In this case we can release our timeslice for a certain number of milliseconds by calling PROC_sleep(). Here we not only allow our process to swap but also set a timer telling the Process Engine that we won’t be ready to execute for a while. Along these lines to keep options open and flexible there is also a PROC_delayed() call. This sets the wait time so our process won’t run again until the specified time (uptime as opposed to RTC time). Add to this a PROC_pause() method that stops a process until another process specifically allows it to run again. Finally there is a PROC_terminate() method which, like it says, terminates the process. This removes the process from the Process Table . A process may be preempted at any time. This is likely to be in the middle of the assembly language executing a C statement. There are times when critical system structures are being read and updated. An interruption an an inopportune moment can invalidate an update and cause system issues. This is handled through the implementation of a CRITICAL SECTION. A process can execute an ENTER_CRITICALSECTION macro. This establishes a section of code that cannot be swapped. Once the critical system structures are updated the EXIT_CRITICALSECTION macro restores normal swapping. While this seems to violate our statement earlier that the CPU cannot be monopolized, the Critical Section functionality is only available for use in JANOS system code and not by external application programs. It is not available to third party programmers. Those programs cannot monopolize the system. At least not so easily. Critical Sections can be nested. That is just handled as a counter which is incremented upon section entry and decremented on exit. As a result there are very few situations where system interrupts must be disabled to prevent issues. This keeps the interrupt processing system ready at all times to service interrupts. Interrupts are not missed. As a result of all this, the Web Server for example can be written without concern for anything else that may be running. It can also execute processes of its own. An example here is the PHP Scripting Engine which is started by the Web Server. This allows the Web Server to service other requests while a PHP program is compiled and then executed. Such complex interactions occur very smoothly and cleanly. When a tick generates an interrupt only some registers are preserved on the stack. JANOS uses some inline assembly to also push R6 thru R13 and FP register. The two stack pointers are then passed to the scheduler which may or may not update them depending on what else need to run. ** pointers independent of C optimization effects. These are the additional registers that I mention needed to be saved. Once the Process Engine became available the main.c proceeded to start Network and System processes as I have mentioned. Eventually in development of JANOS the Network process has to start receiving and then sending packets over the Ethernet LAN. That makes sense but we are kind of blind. That makes it difficult to develop and debug. So the next process that we created was designed to handle command line interaction through the serial RS-232 (COM) port. The main.cprogram had been outputting notification strings on this port as the various events were occurring but we couldn’t interact with it. Just prior to becoming the Idle process the main.c program outputs a “Hit any key to login” message. We are not going to start a process for command line interaction until we know that there is someone there to use it. This established the need for Polling Routines. A polling routine is a routine that can optionally be associated with a process class. It is called once every millisecond tick. Obviously these routines cannot do anything lengthy or they would significantly add to the overhead in the process engine. We would use this to detect an “any key” condition on the port and to then start the command line process. So a structure for process design had started to evolve. The main.c program calls an initialization routine for each subsystem. For the command line process it calls CMD_initialize(). This initialization routine would indicate that it is “Starting command services” and issue the “Hit any key” message. Eventually when we got the network up and running it would start a Telnet server. The CMD_initialize() routine registers the CMD_polling() routine before returning. That polling routine merely checks the status of the serial port buffer and if a character is pending (the ANY key) and the command line process is not running, the CMD_process() is started. Eventually we will use polling routines to check and handle timeouts and watchdogs among other tasks. It is a key aspect of the process engine and perhaps even a necessity. This can be very useful if you are looking for a specific entry in a log file. Here is the HELP for the command. The only difference in the aliases is that the EGREP usage assumes the -E option allowing the search string to be a standard REGEX expression. It is the same as GREP -E or FIND -E.
The -C option counts the lines. Alright now there are 6 lines because I just updated using the MANIFEST command twice having seen that it has been a while. The -N option will include the file line numbers with the matched lines. And, if you know the case of what you are searching for you don’t need the -I option. 356: 11/02/17 08:28:32.943, Manifest updated. 357: 11/02/17 08:32:43.210, Manifest updated. 362: 11/02/17 11:31:03.541, Manifest updated. 812: 11/20/17 07:38:17.390, Manifest updated. 930: 11/22/17 10:20:35.847, Manifest updated. 931: 11/22/17 10:20:45.876, Manifest updated. As a general rule (with very few exceptions) options on the command line can be entered separately or combined. The may appear anywhere on the command line. Commands and options are not case-sensitive by the way. The -H option not only provides the line number in the file but also includes the file specification which some error processors like to use. /jniorsys.log: 11/02/17 08:28:32.943, Manifest updated. /jniorsys.log: 11/02/17 08:32:43.210, Manifest updated. /jniorsys.log: 11/02/17 11:31:03.541, Manifest updated. /jniorsys.log: 11/20/17 07:38:17.390, Manifest updated. /jniorsys.log: 11/22/17 10:20:35.847, Manifest updated. /jniorsys.log: 11/22/17 10:20:45.876, Manifest updated. Note that the output at the command line can be sent to a file using the traditional ‘>’ (create new file) or ‘>>’ (append to file) syntax. Here we listed all of the Clock synchronization events that made adjustments of 10 or more milliseconds in either direction. Then we count how many others (less than 10 milliseconds). It is important to note that when escaping characters in a REGEX on the command line you must escape the escaping character. So in Regex you would escape the open parenthesis (which would normally start a group) using \(. On the command line this must be entered as \\( as you can see. Try the last search with the -M to underline matches. You can see that with a Regex the matching groups are also displayed along with its length. With Regex, Group 0 (\0) is the entire match. We can separate the magnitude of the adjustment into its own group as follows. As we hoped Group 1 (\1) contains the part of the match representing the magnitude of the adjustment. You can probably figure out how to include the sign of the adjustment in the group now if that was what you really wanted. The -M option can be very useful in creating and debugging a Regex for use elsewhere in an application or PHP script. I should probably cover Regular Expressions in some detail someplace. I put that on the TODO list. 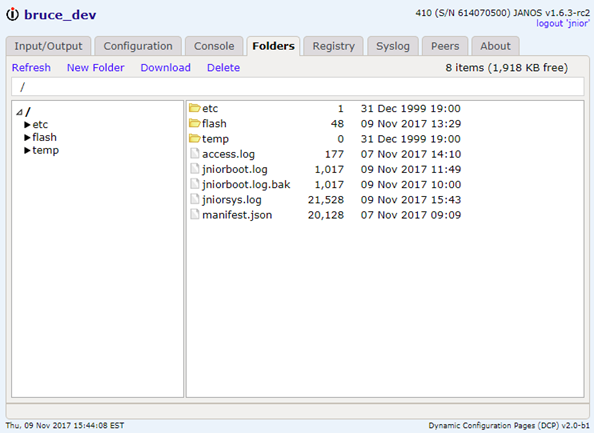 By the way, we have been searching the system log (syslog) as stored in the /jniorsys.log file. That is not all of the event history available. You might notice in the Syslog tab of the DCP that entries go further back in time. So if we had wanted to search all of our syslog history then we could do the following. Seems that there is only one such event prior to October 24th. The syslog ages to a .BAK file when it grows to about 64KB in size. This shows how you can concatenate files under JANOS. I haven’t implemented some of the syntax of the DOS COPY command that would let you do that. Maybe some day. There doesn’t seem to be much demand for it. We are all familiar with logs. These are text files someplace that list events such as logins, configuration changes, errors, etc. On the JNIOR the jniorsys.log file is one such log. These things are useful for systems and web servers. The JNIOR is also a controller and it can be very useful to have a log of I/O activity either digital or serial. This is provided by the IOLOG command. The above HELP alludes to some different logging capabilities. There is something with transitions. That is a detailed log of recent Digital Input and Relay Output transitions. 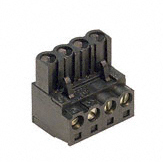 That even includes relays contained in the external expansion modules. The AUX port supports a bidirectional Transmission Log that details communications traffic that includes both the bytes and the timing. 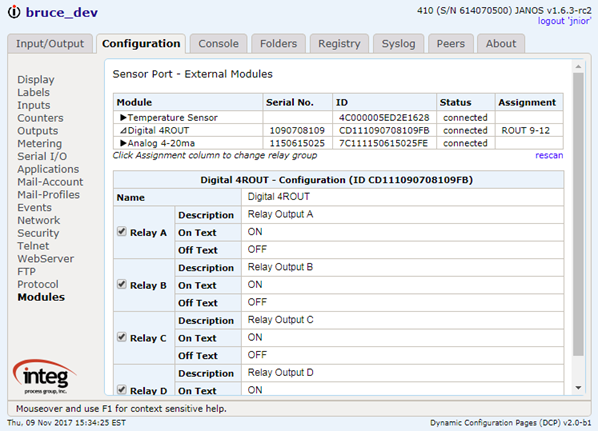 There is also a log for the Sensor Port. The Series 4 JNIOR by default logs all all of this activity to internal buffers. At any time you can dump the log buffers into a file or to the display using the IOLOG command. The IOLOG -R command can be used to reset a log. This can be useful in debugging where you don’t want to be distracted by prior data. I will show some examples. 35  30  30  20  20  20  20  4A  41  4E  4F  53  20  76  31  2E     500    JANOS v1. 20  20  20  FE  42  01                                                ~B. 68  20  53  63  72  65  65  6E  FE  42  01                         h Screen~B. 47  01  02  20  FE  47  01  03  7E  FE  42  01                     G.. ~G..~~B. -45- FE  47  02  01  20  20  20  20  20  20  20  20  20  20  20     E~G..
30  31  37  FE  47  02  04  20  20  20  20  20  20  20  20  20     017~G..
47  12  02  34  30  FE  42  01  FE  47  13  02  31  FE  42  01     G..40~B.~G..1~B. FE  47  13  02  32  FE  42  01  FE  47  13  02  33  FE  42  01     ~G..2~B.~G..3~B. 69  74  61  6C  20  49  6E  70  75  74  73  FE  47  01  02  20     ital Inputs~G..
70  6C  61  73  68  20  53  63  72  65  65  6E  FE  42  01         plash Screen~B. Here we see data in a traditional dump format with 16 bytes displayed in hexadecimal on the left and an ASCII representation of each byte on the right. If the byte does not represent a printable ASCII character it is replaced with a period ‘.’ in the text display. The AUX serial communications can be bidirectional. Bytes received by the JNIOR are shown enclosed by a dash ‘-‘. In the example above there are single characters received (keypress codes). When a longer message is received the dashes make the incoming data appear to be desplayed over a background line. It is just a way to distinguish direction. If the channel remains quiet for a couple of seconds, the IOLOG output includes a timestamp and includes the duration of the pause. All of this can be very helpful in debugging a serial communications based application. The data displayed here is actual results from an HMI test. The content is explained in detail in a different thread. Here is the link to that discussion viewtopic.php?f=5&t=158&start=20#p316. The interface program generating these communications was developed in the thread. The AUX Transmission log can be sent to a file using the IOLOG -A command. The file will then contain the data in the same format displayed in the prior post. The Digital I/O log has quite a different appearance. This is generated using the IOLOG -O command. The digital log is the default log assumed by the command. This log is generated by combining separate input and output logs. Each can contain up to 500 transitions. Depending on how frequently inputs and relays change you could have data spanning weeks or simply minutes. Each line represents at least one transition. There is a timestamp to the millisecond. A ‘1’ indicates when an input (DIN) is activated or a Relay (RLY) closed. The inputs and relays are shown from right to left. So the last transition in the above log shows Relay Output 2 opening. There can be up to 16 relays and 12 inputs logged. The IOLOG -R command will reset the digital log and not affect others. The IOLOG command without options will store the digital log in a file. There is also a log for the Sensor Port but unless you are intimately familiar with Dallas 1-Wire communications none of it will make sense. You can write an application to take control over the Sensor Port and communicate with a custom device or non-standard device. It you are working at that level then this log could be very helpful. The Sensor Port log follows the same format as the AUX Transmission Log. So you’re developing an application. It works, but you question if it is efficient or not. That is where the THD command comes in. The THD command will show all of the threads that are active in each Java application that is running. This command will also show other useful JVM information. Information such as the number of unique classes that have been loaded, the amount of memory that has been allocated to hold that class information, process time, heap memory usage, stack usage and class object memory usage. Then each thread is listed showing its processor usage time, thread name, the class that implements the thread, parent thread, state and whether or not the thread is a daemon thread. Lastly any Watchdog that has been activated is listed with its name, the action that will be carried out should the watchdog be triggered and how long until the watchdog will be triggered should it not be fed. Here is a quick application that tests the Watchdog. You can see that at the time the thd command was executed the Watchdog was about to expire, within 1 second. Here is the code listing for the above test application. * times and then left to be triggered. When it gets triggered we should see the registered action get carried out. // sleep for 30 seconds and then feed the watchdog. And here is the associated log entries from the jniorsys.log. As expected the timing works out. The watchdog was started, 30 seconds later we log that it was fed and then 60 seconds later we get the Assertion indicating that the reboot sequence has been commenced. 15 seconds are given to applications and system processes for safe shutdown. Have you changed the 'jnior' account password? So we recommend that you change passwords. A lot of our customers don’t see the need since their JNIORs are on secure networks supposedly. But, it is important to note that if you do change the password for the ‘jnior’ account that isn’t enough. There is another Administrator account, ‘admin’. Don’t forget to change that password. Or, just disable or delete the account. There are also ‘user’ and ‘guest’ accounts that may or may not be active. This is an issue with both Series 3 and Series 4 JNIORs. The JNIOR Connector Kit contains 5 connectors. 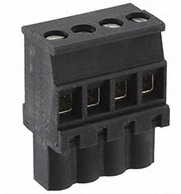 Four (4) are the 8-position female screw terminal types for I/O connections and one (1) a 4-position connector of the same style for the power connection. The latter will also be found on power supplies that are obtained from INTEG. here are the part numbers. They look like this. The others having 8 positions of course. 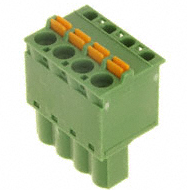 These are SINGLE ROW FEMALE TERMINAL BLOCK PLUG 0.200″ 5.08MM PITCH. Color is irrelevant although INTEG tries to supply BLACK for digital signals and power, and GREEN for analog (external modules). There are alternatives to these connectors that you can source separately. INTEG does not stock an alternative although arrangements can be made upon request. Connectors are generally an expensive part of the product. These two-part connectors add value to the JNIOR. If multi-strand cables are used it is recommended that either the stripped end of the wire be properly tinned or some form of crimp pin be employed. If neither is convenient then insure that the stripped wire is tightly and cleanly twisted and clamped securely by the connector. Cables should have sufficient slack so as to not stress the connection as connectors are inserted or removed. Ty-wrap cables for a single connector together within 3″ of the connector to provide strength in numbers. If solid cable is used then it is important that cables have sufficient slack so as to not bend the cable at the connector when the connector is inserted or removed. Ty-wrap cables for a single connector together for added protection. Screw terminals should be hand-tightened strongly. Periodically check screws and tighten as necessary. Repeated changes in temperature can over time loosen screws. Clamping more than one cable at a connector position is not recommended. In this case the clamping mechanism will grab the largest diameter wire more strongly creating an intermittent and loose connection with the other. If you must chain wiring in this fashion either tin wires together or tightly and cleanly twist them before clamping. Carefully wiggle both wires separately to insure that both have been securely captured. When stripping wire use the proper tool with the proper wire gauge setting. Be careful not to cut into the copper conductor. This is highly likely if using a knife to remove the insulator. This can completely cut outer strands of multi-stranded cables reducing their current carrying capacity and increasing the possibility of a poor connection when clamped. Over time as cables are flexed cables that are improperly stripped will tend to break where the insulator has been cut. If your wiring reaches the JNIOR from above you may consider a connector style where the cables leave the connector at 90 degree angles. For example you can source connectors like this one. This is Pheonix part nubmer 1836901 and these are available from other manufacturers. There are screwless connectors. These use spring force to achieve clamping and have the advantage of not loosening over time. There are different approaches. Here is one example. If strain relief is an issue it is best to secure the cabling to the connector. An arrangement like this can be helpful. 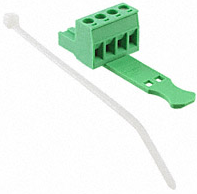 This eliminates the flex at the cable end where wires may break or loosen. Now if you are willing to carry another crimping tool you can take a different approach. This would be much more appropriate when the JNIOR is installed within another product or rack mounting. Here you by just the housing and crimp a pin on each wire which is then inserted. Here there is no question of loosening and strain relief is built-in. That assumes you are proficient at crimping. This is Pheonix 1808832 and I will attach the data sheet as well. 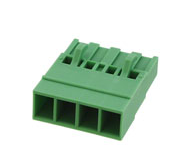 If you are using the JNIOR PCB without the housing as part of your product and are will to purchase in quantities of say 100 and allow for a standard lead time we can accommodate any connector arrangement. The PCB holes are on 0.200″ (5.08mm) centers. Depending on the commitment we can also create a custom PCB to meet your specific needs. This is not as expensive as you might think. Cost does depend on quantity. Call us. We are willing to work with you. There is no cost in asking. 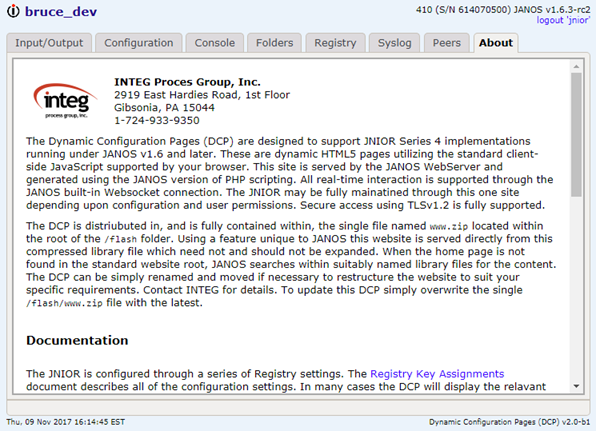 DCP stands for “Dynamic Configuration Pages”. This is just a fancy name for the default website served by the Series 4 JNIOR out of the box. Once you have powered your JNIOR, connected it to the network, and assigned it an IP Address you can access the DCP using your favorite browser. This website is contained in, and served from, the /flash/www.zip file on the JNIOR. You can use the DCP to monitor your JNIOR. Through the Input/Output tab you can see the status of each Digital Input and Output Relay. This tab offers two pages (listed down the left column). These are the Internal I/O and External I/O pages. If you log into an account with sufficient permissions you can control the relays. The appearance of this page can be configured through the Configuration tab. The labels can be redefined as might be appropriate for your application. You can remove unused inputs and outputs and even mask features such as usage metering if not of use. The External I/O refers to external modules that you may optionally use with your JNIOR. INTEG can supply a Power Relay module, analog modules for 10V or 4-20ma, and even temperature sensors. One or more of these may be daisy-chained on the Sensor Port. If you have any of those they can be monitored and controlled in the External section of the Input/Output tab. The Configuration tab is available only to Administrator accounts. This provides a dozen and a half pages covering most every aspect of your JNIOR. The Display page configures settings that affect the appearance of the Input/Output Internal page. Here you may disable any channel which simply removes the channel from view on the Input/Output tab. This does not disable the function of the input or output. It merely allows you to hide unused or background channels. Similarly you can hide Counters, Usage Meters, Alarm indications and Controls. For relay outputs you can select the Pulse control instead of Toggle if appropriate. You may even alter the coloring used in showing the input or output state. Note that each item of configuration is associated with a Registry Key. If you hold the mouse over a setting the related key is displayed in a Tooltip. Configuration settings that differ from default will appear in the Registry which can be viewed and edited directly using the Registry tab. More on that in a bit. While the mouse is hovering you may hit F1 to view the built-in Registry documentation. The Labels page provides the ability to configure the text displayed on the Input/Output Internal page. In addition to Descriptions and I/O State labels you can change the units for the Counter. This page is shown for the Model 410 which has 8 inputs and 8 outputs. The DCP will display different arrangements for the Model 412 and 414. The former having 12 relay outputs and only 4 inputs. The latter with 12 inputs and only 4 outputs. The Inputs page affects the function of each input. 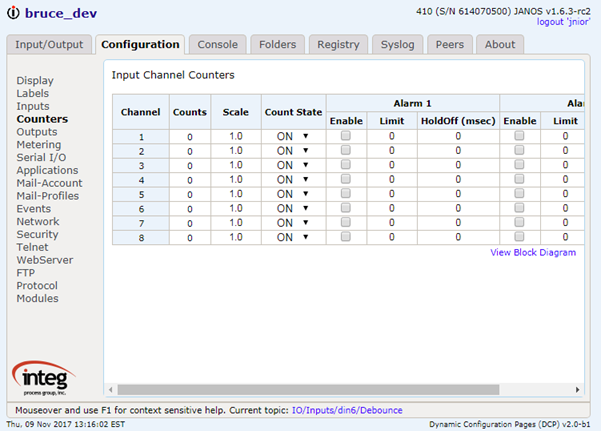 Here you can configure inversion, debounce and a number of other characteristics for each of the available inputs. A Block Diagram is available through the provided link to help in visualizing input configuration. We can cover the details under another topic. The Counters page sets counter configuration for each input. The JNIOR counts each activation of an input. Here you can configure how that is to happen and how it is displayed. You can scale a counter if each activation represented a number of items or a fractional amount of something. Here you can see the value of changing the displayed counter units which are configured on the Labels page. Here you can also configure two different Alarm levels. Alarms are displayed on the Input/Output Internal page. They are also Events that can issue email notifications. On this page you can also mouse over an input and click the displayed “X” to easily reset a counter to 0. The Outputs page provides state configuration for Usage Metering. The JNIOR tallies time for each activated input or output. This would potentially be useful for Preventative Maintenance. Here you can also set the default Pulse duration that would be used if you elected to configure a Pulse control (button) for the output on the Input/Output Internal page. The Metering page displays the accumulated time for each Usage Meter. Like the Counters page you can mouse over a Channel and click the displayed “X” to reset the usage. 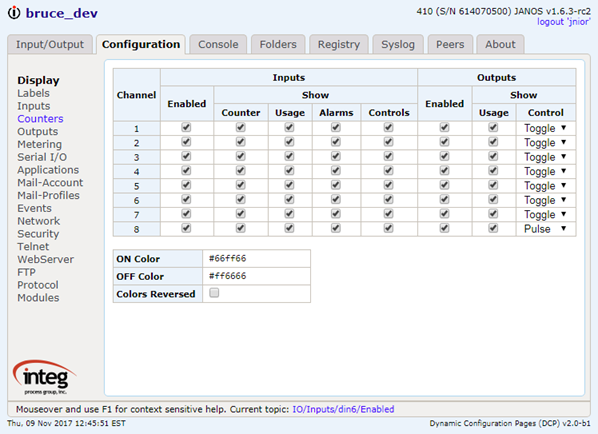 Here you can also set the active usage state and configure alarms. This alarm can be set to send an email notification on the Events page. The JNIOR has two serial ports. 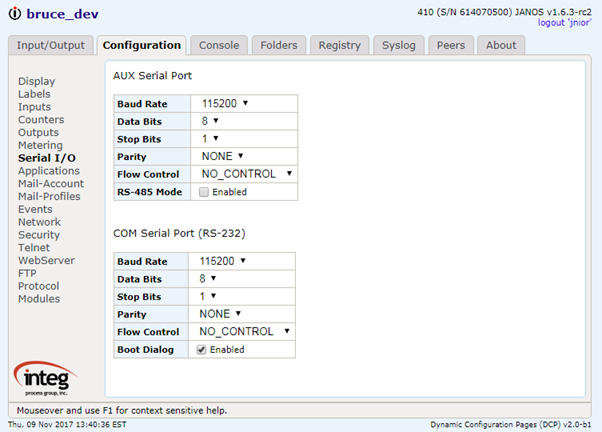 The Serial I/O page can be used to set communications parameters for each port. The defaults are shown. Generally an Application Program is used to perform communications over a serial port. The program itself may configure communications parameters. There are times where you may wish to set the parameters outside of an application. 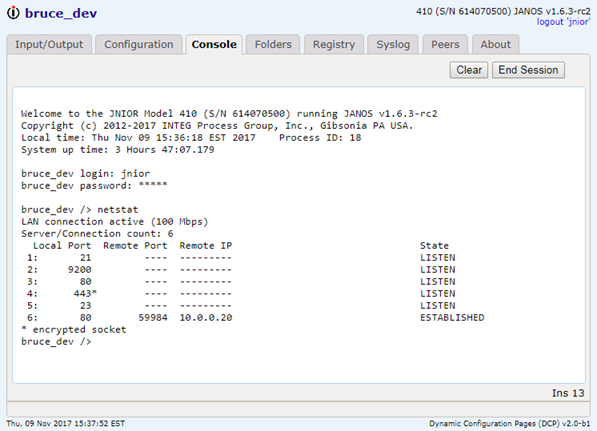 The IOLOG command provides access to a Transmission Log for the AUX port. You can set the Baud Rate and then check the IOLOG to see if data has been received properly. The Applications page lists Registered Applications. Applications are automatically Registered during boot provided that a JAR file exists in the /flash folder containing a properly formatted appinfo.ini file. The content of the Applications page then may vary significantly from one JNIOR to another. An application may be set to run at boot. When you check the box associated with the application the appropriate Registry Run Key is created. On reboot the application will automatically start. If available a link is displayed that can lead to additional configuration pages specific to the application. Note that the checkbox only affects the status of the application after boot. The starting and stopping of applications at any other time is performed at the Command Line which can be accessed through the Console tab. Each JNIOR has the ability to send email notifications. Applications can be written to generate emails and potentially received them. Outgoing email requires a valid client account. 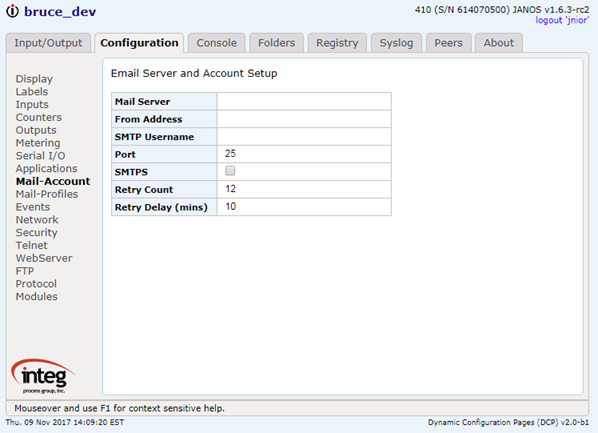 The Mail-Account page is used to configure the outgoing email capability. Here the Mail Server is something like smtp.comcast.net and the From Address would be the email address for a Comcast account. When you enter the SMTP Username you will be asked for a valid Password. The password is securely stored in the Registry. The remaining settings define the SMTP port, security and other characteristics for the communication. These are the credentials use in submitting outgoing emails. Email notifications can be generated for a number of Events if enabled. JANOS has default structures for those notifications. 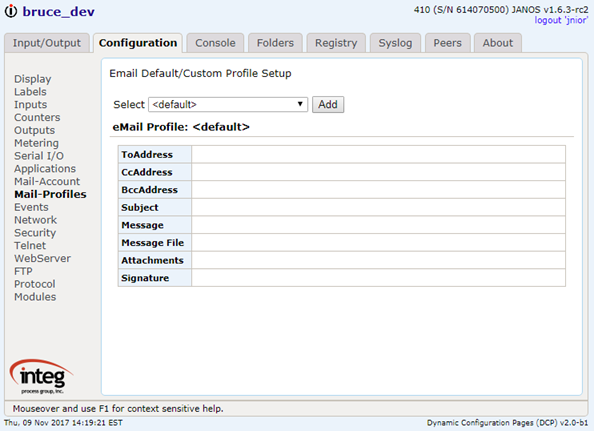 You can optionally define any number of custom email messages as Profiles using the Mail-Profiles page. When the default content is insufficient these profiles can be referenced by name to define custom email recipients and content. There is a small set of built-in events. 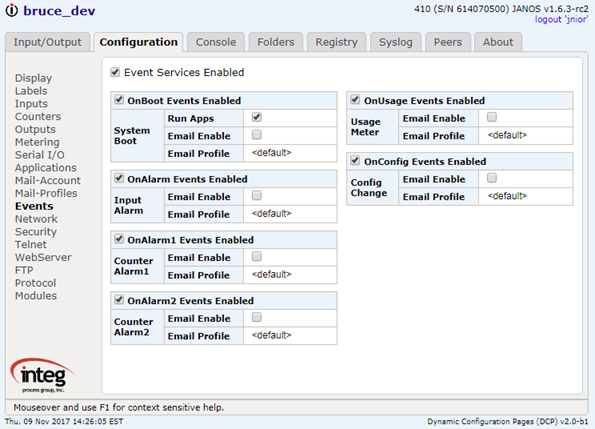 The Events page is used to configure the actions associated with those events. For the most part this involves enabling an email notification and defining an optional email profile. Beyond those listed here an unlimited number of events and actions can be accommodated through application programming or direct configuration of the Registry. Note that the automatic starting of application programs can be disabled here without need for removing the Run keys. The JNIOR is shipped configured with an IP Address of 10.0.0.201. This likely will not work for you. To configure the network addressing you can run the Support Tool. The Support Tool is a Windows application that you can download for free from the INTEG website http://www.integpg.com/support/jnior/. You can also make a serial connection to the RS-232 (COM) port and use the IPCONFIG command at the command line. Once you can access the DCP you can modify settings through the Network page. The Security page offers a couple of settings. The Series 4 JNIOR can perform secure communications using Public Key encryption and SSL/TLSv1.2. By default a 1024-bit RSA key pair is used in concert with automatic self-signed certificates. This means that you can access the DCP using a HTTPS connection. You can also perform secure FTP transfers and Telnet connections. The latter is best done with a client program available from us. Of course, you do not need either FTP or Telnet as the DCP offers most of that functionality. While it doesn’t seem prudent you can disable the SSL capability here by deselecting SSL Enabled. Perhaps more appropriate is enabling SSL Required. In this case FTP and Telnet connections must perform STARTTLS and proceed securely. The standard HTTP port (Port 80) is closed. You can continue to make the secure connection using HTTPS (Port 443). Email will only be transmitted securely. IP Address filtering is available. The Allowed IP Addresses field can be set with a comma delimited list of IP addresses that can make connection to the unit. This field can also contain a sophisticated filter string. It is recommended that the documentation (use F1) be viewed before setting this field. You can block yourself. In that case you will need to make the serial Command Line connection and remove the filter through the REGISTRY command. The Telnet page simply lets you relocate the port. You may want to do that to hide it from casual connections. You can also disable the server entirely. You can do that since you can access the Command Line through the Console tab of the DCP. 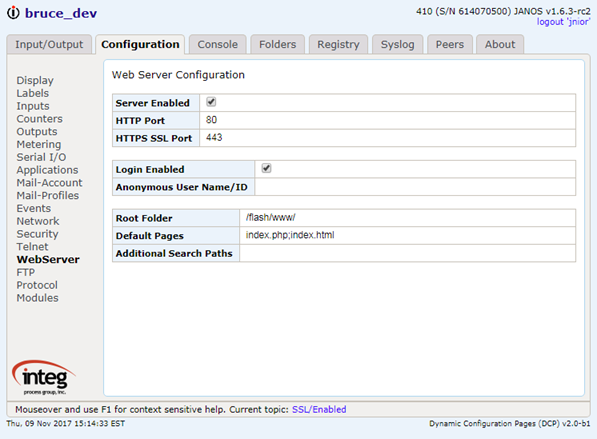 The WebServer page is used to configure the Web Server. Here you can relocate either the HTTP or HTTPS ports or both. You can disable the Web Server entirely. That also prevents use of the DCP but your application might demand the limited access. By default web access requires a login. You can disable the login requirement and to do so you must also define a user account for anonymous access. If your JNIOR is physically secure and the network is isolated from the larger network you might disable the login. If otherwise you have some pages that you wish to share publicly you can place them in the /flash/public root. Pages are served from that area without the need for authentication. 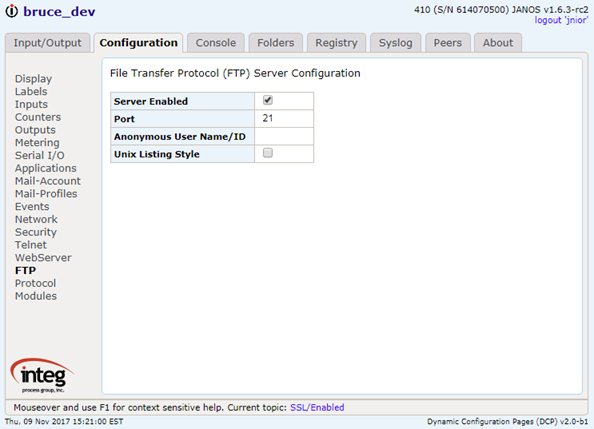 You can relocate or disable FTP using the FTP page. You can disable FTP and still manage the JNIOR’s file system through the Folders tab of the DCP. Anonymous FTP access is not recommended. You can allow that by defining a user account to be used for that. The JNIOR Protocol is deprecated and not recommended for new applications. The Series 4 offers a more modern Websockets interface which performs all of the same function and much more. It is also not binary. The JNIOR Protocol is still supported. 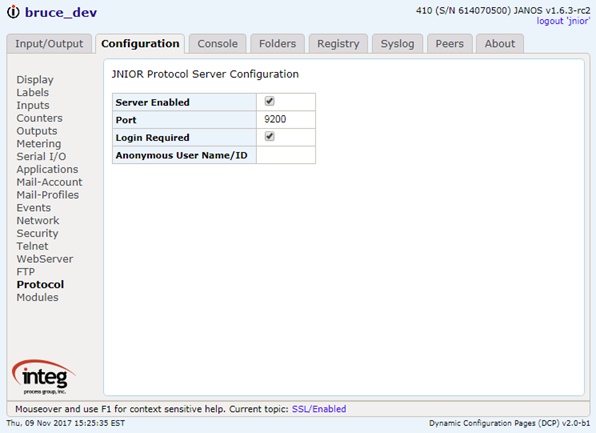 The Protocol page can be used to relocate the JNIOR Protocol port. The server can also be disabled. We would recommend disabling the JNIOR Protocol unless you know that it is used. It is also highly recommended that the login requirement not be disabled. If you do so you must then define a user account for the anonymous access. 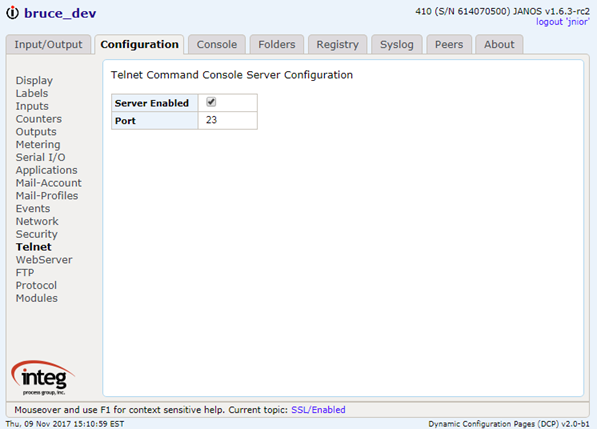 And finally for the Configuration tab is a page for the configuration of external modules. If you use an external module it will be listed here on the Modules page. If you have recently connected a module and don’t see that one you can select ‘rescan’ to update the list. 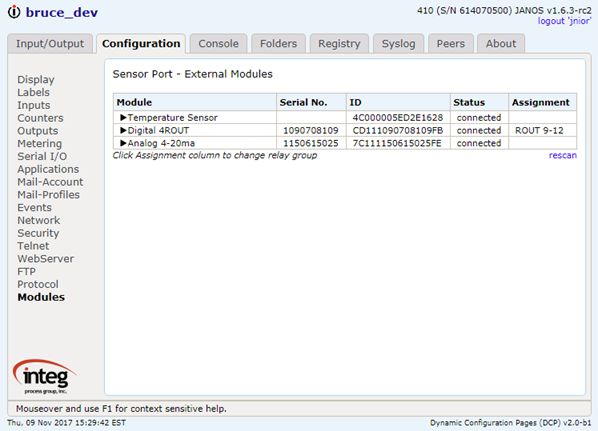 If the external module has configuration setting those can be seen by expanding the module. Click the triangle shape. For instance the 4ROUT labels can be altered for use on the Input/Output Externals page. The Console tab provides access to the Command Line interface. This is similar to a Telnet connection but performed entirely through the web interface (Websockets). Note that an additional login is required here. You can cut and paste here. That would be one advantage over a Telnet client. You can also drag a file to this window. That will place the file into the /temp folder convenient for further use from the command line. You might drag a UPD here and once it transfers use the JRUPDATE command to update the operating system as an example. The Folders tab provides a file explorer formatted view into the file system. You can navigate through folders by clicking on the left tree or double-clicking folders on the right as you might expect. Files can be selected and downloaded. You can also delete files and create folders. Drag and Drop is supported both into and out of the folder. Although in that case there is some variation in availability depending on the browser you are using. I use Chrome extensively. That seems to provide all of the needed capability. The Registry tab provides an explorer view into the Registry. Here you can edit and remove keys as needed. Each setting found in the Configuration tab is associated with a Registry Key. You can make settings here if you know the proper key and format. It is recommended that you become familiar with the Registry, There are some settings that are not accommodated by the DCP GUI. You will need to enter those here. The Registry can also be manipulated from the Command Line. The DCP contains built-in and detailed Registry documentation. The Syslog tab displays the System log detail in chronological order with the most recent event at the top. This is the content of the /jniorsys.log and /jniorsys.log.bak files concatenated. You can scroll then through all of the available log history in order from most recent to the oldest. Here I’ll show a segment of the HoneyPot Syslog since my development unit sees a lot of crazy use and its log is full of confusing stuff. In fact you can see in this log where JANOS was recently updated. The infected.json file that keeps getting updated is the database for the http://honeypot.integpg.com/map.php application running on that unit. The HoneyPot JNIOR is connected directly to the Internet. The Peers tab provides quick link access to other JNIORs that you may have on the network. The Series 4 JNIOR is aware of nearby peer products. Here you can move to the DCP on these other units using the link provided. That can be convenient if you have many JNIORs. Okay, so here at INTEG the Peer list gets crazy. For many this list will be short if there are any at all. And FINALLY! We have the About tab. This actually contains some text and potentially useful information. Make sure that the Serial Input Buffer Size is adequate for your application. It is 128 bytes by default. If a greater number of bytes that the buffer size are sent and your application does not read them in time then the buffer can fill and data will be lost. The output should look as follows.